Automatic School Bell Timer is designed to automate electric gong bell or siren activation for specified time. This device greatly helps to the institutions to eliminate manual time keeping system. 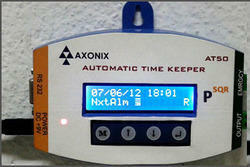 Automatic Time Keeper is designed to automate electric gong bell or siren activation for specified time. This device greatly helps to the institutions to eliminate manual time keeping system. ATK removes worries regarding attendars presence for ringing the bell or siren. ATK simply follows time period specified in it by the user and activates 230V AC supply to connected Gong bell or siren for the specified duration and then deactivated. Regular & Exam Alarm modes are available in ATK. Emergency alarm switch also available for immediate activation of bell or siren. We are a noteworthy manufacturer and supplier of a comprehensive range of School Bell Timer. Our offered timer is designed by our adept professionals using optimum quality components and modern technology in line with the industry quality norms. This timer helps to the institutions to eliminate manual time keeping system. Apart from this, our provided timer undergoes different tests under the guidance of quality examiners to ensure its quality. We offer this timer to our clients in various specifications and customized options.